McGREGOR FLY reels have been developed to match our range of rods perfectly, from the lightweight 3/5 trout reel to the heavy-duty 12/14 salmon/saltwater model. Machine cut from top quality 6061 aircraft aluminium alloy material, their large arbour design ensures minimum line memory and fast retrieval. The high degree of milling delivers lightness without sacrificing strength or durability. They feature needle bearings on chrome alloy spindles for remarkably smooth handling. Their carbon disc drag system is sensitive enough to protect even the lightest of tippets but sufficiently powerful to halt the feistiest fish. As line is taken off the reel it creates an attractive clicking sound, but in order to facilitate spinning the reel to return loose line quickly there is no sound device in the opposite direction. Their appealing anodised gun-smoke finish is extremely scratch-resistant and copes with the roughest treatment. They come in a high-quality neoprene red and green bag and are packed in a robust cardboard box which identifies the size of the reel. Reel capacities may vary, depending on the kind of backing line being used. To adjust the carbon disc drag turn the knob on the back of the reel clockwise to increase the resistance, and counter-clockwise to decrease it. The minimum drag setting should never be less than the pressure required to prevent over-running of the line on fast runs. Additional drag may be applied by palming the spool by hand. At the end of a fishing session remember to return the drag setting to zero by turning the knob counter-clockwise all the way. This ensures the perfect functioning of the drag system and a lifetime's service. The spool release screw knob is located in the middle of the reel spool. Simply wind it counter-clockwise and release the spool. To change the reel to right-hand wind, remove the spool, unscrew the mechanism on the spindle and flip it over. Screw the mechanism back on securely and replace the spool. The reel should be cleaned and lubricated after extensive use or contact with dirt or sand. At least twice a year clean and lubricate all moving parts - handle, spindle and gear shaft. Never store the reel away while it is still wet, or into a wet reel bag or tackle box. For extended storage, remove line and backing and remember to loosen the drag system. The disc drag systems in the Trout 7/9, Switch and Salmon/Saltwater reels are watertight and maintenance-free. 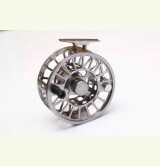 The Trout 3/5 and Trout 5/7 require slight maintenance. Probably the most popular size for the trout fisherman, this reel features classical appearance with superlative engineering. It is a perfect match for our mid-range rods. With the same eye-catching appearance and flawless engineering as its 3/5 cousin, this reel offers greater capacity for situations requiring heavier lines and more backing. 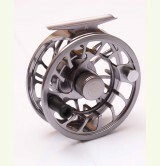 This reel excels in design and performance and with its caged construction offers extra strength and protection. 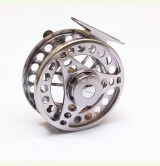 This reel features the same handsome looks and caged design as the 9/13 model.